PRESIDENT Mnangagwa has paid tribute to Vice President General Constantino Chiwenga (Retired), Home Affairs Minister Dr Obert Mpofu and Speaker of Parliament Advocate Jacob Mudenda for playing leading roles in burying former President Robert Mugabe’s dark era and bringing about the new political dispensation. He said the intervention by the Zimbabwe Defence Forces (ZDF), then led by Gen Chiwenga (Rtd), greatly aided Zimbabwe’s return to constitutionalism. Addressing a bumper crowd at Nabushome Primary School on Friday, the President said the three leaders took brave decisions in their capacities to guide the nation towards a peaceful transition that culminated in Mr Mugabe’s resignation. He said Gen Chiwenga (Rtd) in his capacity as ZDF commander understood the responsibility of the security sector in protecting the constitution. “The security sector found it necessary that the flouting of the constitution by members who were not in the executive was not proper. “The criminals who had surrounded our former President had to be removed in order for this country to go back to constitutionalism,” said President Mnangagwa. He said Dr Mpofu, who is Zanu-PF secretary for administration, guided the party accordingly as the most senior at that time while Adv Mudenda led Parliamentary processes. “There are two men amongst us here that I want you to take note of. There is Obert Mpofu and Speaker of Parliament (Jacob) Mudenda,” said Cde Mnangagwa, calling on the two leaders to stand up. He went on: “You see these two men, Mudenda is head of Parliament. When things got bad, in the party we had the Central Committee, which saw thousands of Zimbabwe taking to the streets demanding Mugabe to step down. What they demanded had to happen, but there is a proper way to do things”. 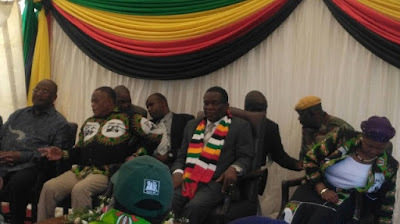 Cde Mnangagwa said out of the 300 Central Committee members, 260 met at that time to discuss the state of affairs in the country and Government. “The most senior among them was Obert Mpofu who chaired that meeting, which expelled the entire G40 cabal and those who were insulting us and left pure Zanu-PF cadres,” he said. “In Parliament, Mudenda appreciated that the constitution of the country must be protected and defended. He is the man who defended the constitution. At the end of the day, Cde Mnangagwa said the former President decided not to face impeachment and resigned. After Mr Mugabe resigned, the President said, the ruling party, Zanu-PF, led by Dr Mpofu resolved to call him back from exile where he had fled for safety after threats to eliminate him following his firing from both Zanu-PF and Government. The party also reinstated him as its Vice President. In terms of the constitution, the party with a majority in Parliament should nominate the person to assume the Presidency. Again President Mnangagwa said Dr Mpofu led Zanu-PF to nominate him to take up the position of the President of the country. “This is why I am here. I then came and was sworn in on the 24th of November last year. From that day 24th November Zimbabwe is different, Zimbabwe has a vision, it has hope and is united,” he said. He dismissed claims that his administration assumed power through a “bloody coup” saying the entire transition process was peaceful.